Thank you! It was so lovely to log on this evening (and with a renewed passion for blogging!) to find that you are still reading and that I even have some new followers. So hello, welcome, and thank you! I was so excited to post today that I didn't even sew in my ends before taking this photograph! I'm slowly coming round to getting on top of my Christmas makes so thought I would break myself in gently, by making a set of my retro coasters in Christmassy colour. Not too overtly Christmassy, but definitely getting into the spirit of things! These will be heading to the shop at the weekend. Now for something totally different....I'm going to my first scientific conference in over 2 years tomorrow. I'm also writing a report of the meeting so need to be alert and pay attention. Early night I think, those ends can wait til the morning! Hi Sally! 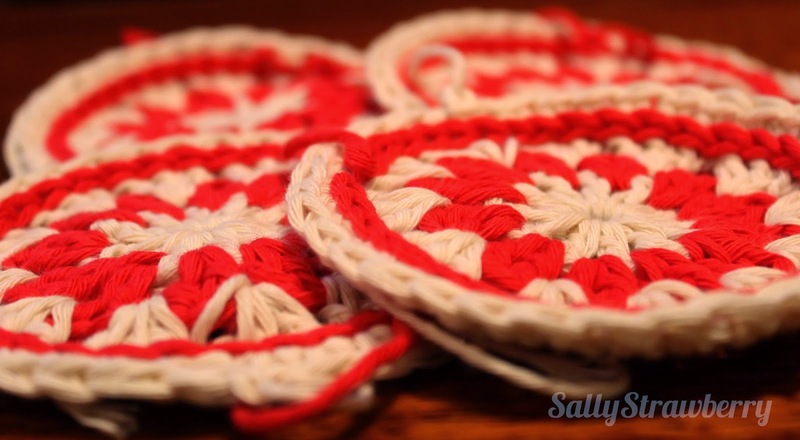 Well the crochet coasters certainly look quite Christmassy!!! :) Love the design! Hope the conference went ok!